The Private Secretary’s Cottage is one of Australia’s earliest and most enigmatic brick structures. It tells a story of adaptation and re-use that is typical of Tasmania’s built heritage. The Cottage began life as an industrial building, which was first depicted in a watercolour of 1813. Its origins are related to the Commissariat Store which was built in 1808-1811 and survives at the entry to the Tasmanian Museum and Art Gallery (TMAG) complex. By the late 1820s it was used to store building materials. In 1828 Lieutenant Governor Arthur was looking for a house for his Private Secretary who worked at Government House, then located on the current site of Franklin Square. Colonial Architect and Engineer, John Lee Archer, recommended the conversion of the industrial building as a residence. Archer’s conversion involved demolishing a nearby house dating to c. 1805 and incorporating its materials into the Cottage. The Cottage thus possesses some of Australia’s earliest joinery. 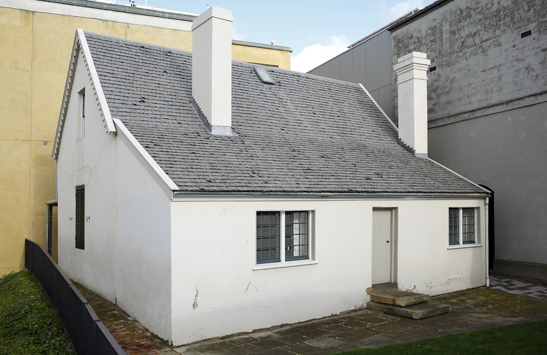 Between 1829 and 1857 the Private Secretary’s Cottage formed part of the establishment of the first Government House, Hobart and was also home to Official Secretaries and Aides-de-Camp. Lieutenant-Governor Sir John Eardley-Wilmot died in the Cottage in February 1847 after being removed from office following a scandal. After the completion of Government House on the Queen’s Domain in 1857, the Department of Public Works occupied the Cottage. In 1871 it became the residence of the Curator of the Tasmanian Museum (later TMAG). In 1901 the building of a new wing of the Tasmanian Museum threatened the Cottage with demolition. However, only the western wall was taken down and rebuilt parallel with the extension. In 1955 the Cottage became museum offices. Its veranda was removed and the façade windows replaced by large metal-framed windows. TMAG’s 1966 extension was built on the Cottage’s front garden and intruded on its original veranda alignment. Since 1985, TMAG has restored the Cottage’s building fabric. Future restoration work will lead to a richer interpretation of the 1828 cottage and its pre-1813 core as an above-ground archaeological record of Tasmania’s founding years. The Private Secretary’s Cottage is closed temporarily for conservation works and will reopen in April 2019. The Private Secretary’s Cottage is generally open on Wednesdays for tours starting at 11:00 am. Volunteer-led tour admission is free but please call the TMAG front desk on 6165 7000 to confirm tour availability. The Cottage is also open on some TMAG Family Days, and is part of the Settlement Secrets theatrical tour of the TMAG complex. For more information, please see our Events page. Curator-led tours of the Cottage may be booked for your in-bound tour group, historical society or community service group. Consider a day out to Hobart’s historic houses through booking a joint tour of the Private Secretary’s Cottage, Narryna Heritage Museum and Markree House Museum and Garden. A minimum of 6 tour participants is required. Discounted group booking rates will apply. The Private Secretary’s Cottage is located on the TMAG site but admission is by guided tour only owing to the fragility of the Cottage’s interiors. To view a selection of images of the Cottage, click here. This page was last modified on 19th March 2019.